The Sanford Process Technologies allow Precision Coating to produce very high quality hard coat finishes unattainable using conventional hard coat processes. As the conventional hard coat process leads to increasing resistance on the part being coated, it is overcome by driving voltage higher (as high 50-80 V is common). This process generates excessive heat. To remain stable, the process requires a cold electrolyte to remove that heat. For many alloys this works, but the conventional process is much more susceptible to burning of castings, alloys with higher copper content, foils and thin parts. In addition, conventional hard coat always results in a drab, dark color. Consequently, it is seldom possible to get a reliable high voltage process that produces a good sapphire-hard hard coat on castings and high copper alloys. Sanford Process Low Voltage technology power supplies use low voltage and high current density through its unique, proprietary design. Sanford Process uses a specialized AC over DC design that removes resistance as the coating forms, allowing the coating to form at a much lower voltage – typically 18-30 V. Without higher voltage, less heat is generated and there is a lower risk of burning. Consequently, the Sanford Process is undertaken using higher temperature electrolytes, and this allows a clear oxide to form. After forty years of use, Low Voltage Hard Coat Rectification is a proven technology that has been used for hundreds of companies across the globe. Due to the high copper content, 2000 Alloys burn very easily, especially on certain geometries where there is a large surface area. SANFORD Process PLUS® has been used for many decades to reliably put 2 – 4 mils of very hard coating that can be certified to MIL-A-8625 Type III requirements. So whether you need to run 2011, 2017, 2024 or other 2000 series alloys, we can provide you with a high quality hard coat finish. Due to the presence of silicon and copper in the alloy, 4000 series alloys, such as 4041 alloy and 4080 alloy are typically not capable of being hard coated using conventional high voltage rectification. However, Precision Coating can provide you with a very high quality hard coat on these alloys. Whether 8017 alloy or other 8000 series alloys, the unusual alloying elements in 8000 series makes these alloys incapable of being hard coated with high voltage rectification. Sanford Process Low Voltage Hard Coat rectification can produce a high quality finish without the risk of burning. The high level of impurities in many castings can lead to catastrophic burning and almost never allows for anything but a very thin hard coat. However, SANFORD Process QUANTUM can produce a hard coat up to 2 mils on castings. 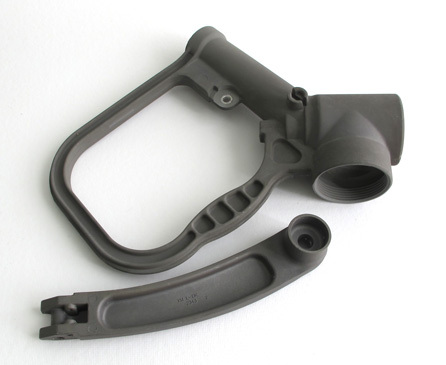 This allows for a tough abrasion resistant finish on castings expanding the areas of use castings can serve.